The first major battle in the Great Northern War was fought outside the Swedish fortress of Narva 20 November (Swedish calendar) or 19 November (Julian calendar, used by the Russians) or 30 November 1700 (Gregorian calendar). This fortress had been under siege by a Russian army (between 35 000 and 38 000 men strong) since September and it was not able to hold out much longer when the Swedish king Charles XII arrived with his army. The Swedes were however only 10 537 men strong and Charles XII took a great risk when he attacked a three times larger army entrenched behind field fortifications (a contravallation). But the fortress of Narva was too important and the Swedes were forced to attempt to end the siege. This enterprise was aided by the fact that the Russian contravallation was too long for the Russian army to properly defend it. Faced against a very thin Russian battle line the Swedes chose to concentrate their attack on two points by attacking in columns. They were also favoured by heavy snow fall which blew against the Russians and obstructed their view. This attack split the Russian army into three parts which were then fought separately by the Swedes. And instead of being a protection for the Russian army the contravallation, screened by Swedish cavalry, became a barrier which prevented the Russians from escaping the battle field. Thus resulting in the battle becoming the greatest military victory in Swedish history. On the Russian side between 8 000 and 9 000 men were killed or injured and most of the injured would not survive the journey back home to Russia. The number of Russians surrendering to the Swedes was so large that Charles XII only took the officers as prisoners and allowed the privates safe passage home. The battle had however been hard fought and the Swedes had also suffered heavy casualties (see below). Even though the Russian army had been inflicted a catastrophic defeat the Swedish army was in such poor condition that a continuation of the campaign into Russia was not considered. The Russians could therefore spend the entire winter to rebuild their army and recover just in time for next year's campaign season. So the battle of Narva was despite of the crushing Swedish victory only the beginning of a 22 year long war which would end in anything but a favourable way for the Swedish side. 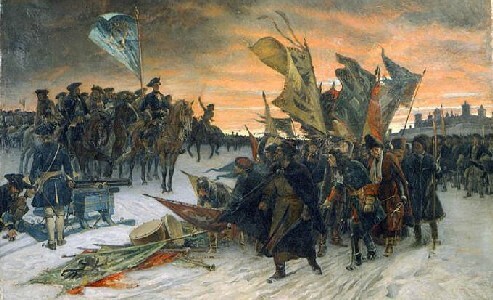 The image above is a painting from 1905 by Gustaf Cederström (1845-1933) and it shows how the Russians surrendered their colours to Charles XII after the Swedish victory at Narva. As usual with this type of paintings not many details are historically correct.